Charles Waud is an expert in traceability, inventory and accounting software for the fresh produce industry. He is President of award winning WaudWare Incorporated. Charles has more than 40 years experience in computer programming and the wholesale distribution industry, starting with industrial supplies and evolving into fresh fruits and vegetables in 1989. 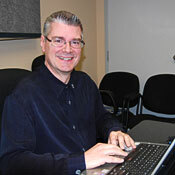 He has shared his expertise with many North American produce organizations including the U.S. Produce Marketing Association (PMA) - Produce Initiative (PTI) Technology Working Group Board Member; Canadian Produce Marketing Association (CPMA); Ontario Produce Marketing Association (OPMA) - Board of Directors. Charles is also involved in creating and maintaining strong and productive links between business and government, both locally and abroad. He has worked with the local Brampton Board of Trade for many years, serving as President, and as member on various committees such as finance, policy and the advancement of multi-cultural businesses in the ninth most populous municipality in Canada. Contact F. Charles Waud.